Yes. The ‘ole 1960s song by the Mamas and the Papas. “Monday, Monday”. Speaking of Mamas, I did absolutely NOTHING for my momma yesterday. And it was Her day! Can you imagine? I should hang my head in shame. Maybe I’ll just hide over here in the bushes instead. Saturday’s Where In The World was, yes, you guessed it (actually you didn’t guess it! ), walking around Lake Abbott at The Peaks of Otter in Bedford, Virginia. Glorious. My peep thanks you all for your Mother’s Day wishes yesterday. Because she didn’t get any from me. That’s terrible. I’ll have to make it up to her somehow. 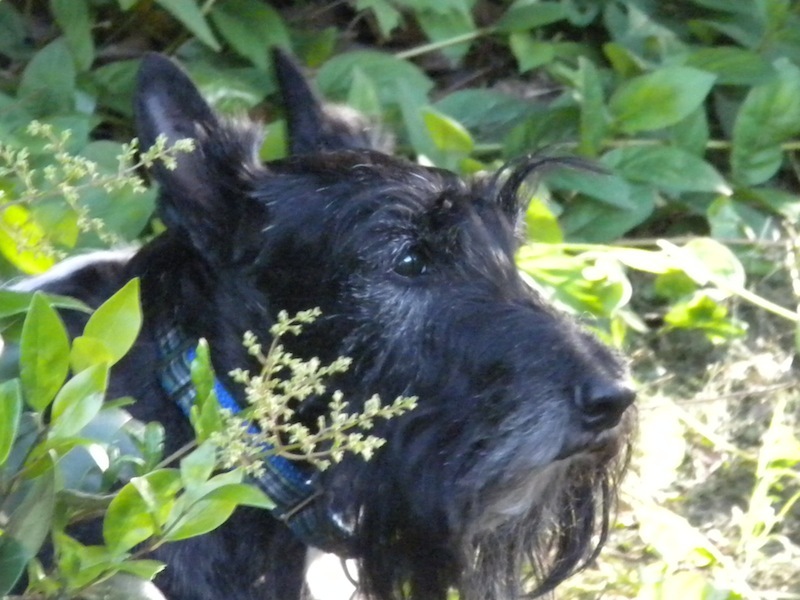 This entry was posted in The Scottie Chronicles and tagged Bedford Virginia, Lake Abbott, Mama and the Papas, Monday Monday song, Peaks of Otter, Scotties, Scottish Terriers, travel, traveling with dogs. Bookmark the permalink. Well you should hang your head, after all she’s done for you! We think you should serenade her with some Aroooooos and some lickies on the face. Well…we messed up also…so don’t feel to bad…we did tell ours thanks when she mad dinner for us though! Monday, Monday…sometimes it just turns out that way. Just give her some extra kisses today Stuart! She will love that! But ya looked cute for her – dat are enuf. That’s all right, Stu. I’ll forgive you. BUT SHE WON’T! Awww Stu, mom’s can be real forgiving about these things especially when the pup in question is as sweet as you are. Oh dear. Extra snuggles and kisses tonight whee thinks! I’m sure your mere presence is special enough for your mumma! You know Stuart you can tell your peep every day how much you love her ~ it does not need to be just one day a year.